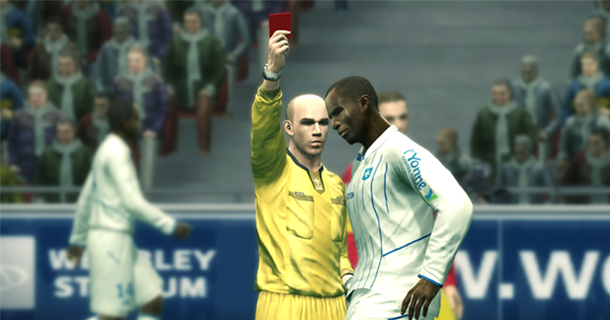 You received a red card in an important PES match! One of your players is sent off. You are now at a numerical disadvantage. Things are looking bad. What do you do? Fret not, as this short PES guide will aid you to survive the match, and even help you achieve a seemingly impossible victory! Well I learned this the hard way when I conceded a rather ridiculous red card, as shown in this PES video. Take a look. 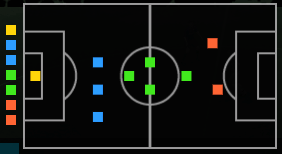 My LB was sent off, and my formation became like this. And what is the one thing to do in PES when you received a red card? In the match shown in the video, I was too lazy to change my formation. The match was 0-0 at the time of the sending off, and I lost 2-0 at the end. Coincidentally both goals came fron my left wing. Their wingers took advantage of the empty space to put in crosses that led to the goals. And here are the 3 simple steps to alter your formation, to have you continue your normal game plan. If your defender received a sending off, which is often the case, sacrifice a midfielder or an attacker for a defender to come in. We have to keep our defence intact and prevent conceding goals, before we can even think of getting a decent result out of the match. Ensure the opponent’s dangermen are still closely marked. 2. Keep at least 2 forwards if you are fighting for goals. 1 lone ranger upfront seldom get you the goals required, especially when you are down to 10 man. The priority is to keep the defence intact, followed by ensuring you have at least 2 forwards upfront. So 4-4-2 becomes 4-3-2 after sending off, 4-3-3 becomes 4-3-2 as well, 5-3-2 goes to 5-2-2, and so on. If you are leading at the time of the sending off, keeping 1 striker upfront is fine. However when you need goals, go for 2 forwards. When your defence are fully covered and you have enough firepower upfront, the sending off will become insignificant and you will find yourself able to play your normal game. With your opponent attacking rampantly to take advantage of the extra man, playing a counter attacking game is your best strategy to get a goal against the run of play. And once you score, take advantage of the momentum to score another! With these 3 simple tactical guide, sending offs will no longer be an issue to you. In this case will depend largely on what your team, who is your opponent, and he was expelled. I’ve turned scores lost games, even with one less. Sometimes it can be considered to balance the attack and defense, without the need to take a midfield to replace the defense. To maintain my offensive team, had to open up a little defense, drawing, Daniel Alves and placing G. Milito, 3 -3 -3. However with Puyol in the middle Rafa Marques Milito left and right. For aorganizar better way to Iniesta pulled the CMF. Beside the front of Xavi and Yaya Toure. I changed tactics for Counter-Attack. (Hint: I always use manual switching tactics as the game rolls R2 + using one of the buttons selected. I usually offensive to their tactics: Ball and X; already in defensive use: Triangle and Square. R2 + Bola – Offensive Pressure. R2 + X – Attack at the opposite end. R2 + Tri – Counter Attack.